Special Size Laminating Pouch Carrier 3-1/8" x 4-1/2"
Coated stock helps ensure that laminating pouches do not stick inside the carriers. Do you need extra carriers for your laminating pouches? These high quality carriers are perfect for use with almost any laminator. They are available in a number of sizes and can also be cut down for custom sized Laminating Pouches . 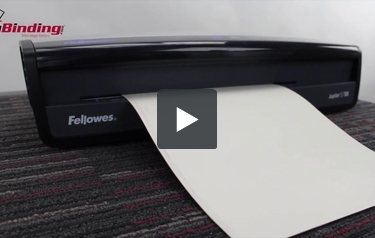 By using carriers when running pouches through your Pouch Laminator you help to keep your rollers from building up adhesive and eliminate the risk of having a pouch wrap around the rollers of your laminator. Welcome to MyBinding video. When in doubt, use a carrier. Do you need extra carriers for your laminating pouches? Our high quality carriers are perfect for use with almost any pouch laminator. Although many laminators claim that you do not need to use a carrier with their product, it is always best to do so if you can. They protect not only your project but also the laminator that you have invested in. Heat can be a real problem for heat sensitive documents and carriers help prevent pouches from wrapping around or getting tangled inside the machine or leaving adhesive on your rollers. They are available on a number of sizes and can also be cut down for custom sized pouches. And all of our carriers are made from coated stock that prevents your pouches from sticking to the carriers. We are the king of customer service and customization, so give us a call and we can make your projects work. When image matters, MyBinding. how many times can you use a pouch carrier before you have to change to a new one? Thank you for your question. There is not a set limit to the # of times you can use a pouch carrier. As long as you keep it clean an unwrinkled you could keep using it. It is just a "envelope" of cardboard that has a coating on the inside. Thank you for your question. The Laminating Pouch Carriers are sold individually but are eligible for a volume discount. The breaks are at 5 ,10 and 20 carriers with a 2%, 3% and 5% discount respectively. The discount is calculated and applied automatically when you add the items to the cart.